I love going to hair salons. The feeling of pampering your stressed out strands is actually quite good. 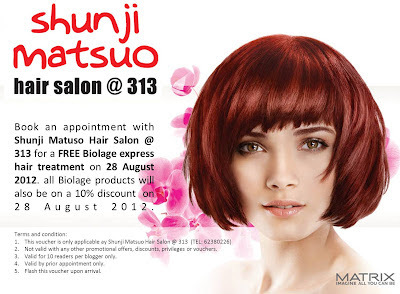 By some stroke of luck, I chanced upon this opportunity to win a free hair treatment from Shunji Matsuo Hair Salon @ 313 and I jumped at the chance. This is the e-voucher that I won! Valid for a FREE Biolage express hair treatment. Biolage is their newly launched product so this is one good opportunity for people to try it out. Word of mouth works wonders. After accessing my hair condition, my stylist proceeded to wash my hair and do the treatment. I've done rebonding before so I'll need fortethérapie some extra care for chemically weakened hair. My hair is also prone to frizziness, especially since lately I haven't been putting on my hair serum, so I'll need the smooththérapie. There are 2 steps to the hair treatment. First, my stylist did the fortethérapie Cera-Repair In-Salon Treatment for me. "fortethérapie strengthens weakened hair, combining forces of science and nature to reconstruct while boosting vitality, and smoothing hair. Damaged hair is strengthened while building resistance against future breakage." Next, he applied the smooththérapie Ultra Control Deep Smoothing Masque. "smooththérapie smoothes frizzy, unruly, medium to coarse hair with the silky serum of Camellia flower seed to continuously control frizz in hot, humid seasons while replenishing hair’s moisture during dry cool seasons. Hair stays naturally smooth,year-round, even in up to 97% humidity*." Approximately an hour later, treatment done! Final detail, a leave in hair serum that left my hair shiny and smooth. Happy me with my pretty hair!